Koen Brams/Dirk Pültau: Between 1979 and 1982, you produced four documentaries on contemporary writers, the Dutch authors Oscar de Wit (1979), Jacq Vogelaar (1981) and Hans ten Berge (1982), and the Belgian writer, Daniël Robberechts (1981). Before that, you had made a film based on the literary work of the Belgian writer, Maurice Gilliams. The title of that film is, ‘Het gedroomde boek - Variaties op Vita Brevis’ (The Envisioned Book: Variations on Vita Brevis). When did you first become interested in Gilliams’ work? Jef Cornelis: I was familiar with Gilliams’ work when I was growing up. At secondary school his work was well represented in the standard humanities anthologies – including his novel, Elias of het gevecht met de nachtegalen (Elias or the fight with the nightingales), published in 1936. If I recall correctly, together with some other students at the Sint-Michiels College in Brasschaat, I set up a poetry programme that included some of Maurice Gilliams’ poems. The image I had of Antwerp in the 1910s, 1920s and 1930s was what he had described. It was brilliant. I knew Antwerp through my maternal grandparents. I spent much of my childhood with them. Gilliams was also important for me because he led the way to the work of the painter, Henri De Braekeleer. K.B./D.P. : For Het gedroomde boek (The envisioned book), you worked with Georges Adé, who drew up the concept and was responsible for part of the film script. Why did you involve him in the film? J.C.: I knew that Georges was very familiar with Gilliams’ work. We had already had many discussions about it. I also got on well with Georges. For me, the choice was self-evident. But an opportunity for a production like this only presents itself once in a lifetime: both the public broadcasting service – my employers – and the writer had to agree with the idea. K.B./D.P. : In the credits, it is not Georges Adé who is identified as the person who came up with the concept and the co-author of the script, but Laurent Veydt. That is Adé’s pseudonym. Why did Adé choose to use his pseudonym for the film? J.C.: I don't know. I thought he primarily used the pseudonym for his experimental prose. K.B./D.P. : In your archives, in the first written concept that we found for the Gilliams film, it was already clear that Het gedroomde boek (The envisioned book) (there is, by the way, no indication of that as the title, nor of the first working title, Er is niets dan hevig wit in mij [There is nothing but violent white in me]) was not going to be an ‘ordinary’ documentary. On February 17, 1977, Adé proposed “making a cinematographic composition around the texts – the text – of M.G.”. Did you ever consider doing a classic documentary on Maurice Gilliams? J.C.: From the beginning, we intended to produce a film equivalent of Vita Brevis, Gilliams’ collected works. We wanted to convey the atmosphere of Gilliams’ work. A documentary would not have been possible, anyway. Gilliams is impossible to pin down. He hid himself away. You could talk to him, one to one, but he would completely shut down in front of a camera. J.C.: I was already in contact with Gilliams when Georges formally invited him to discuss the film project. K.B./D.P. : Had you sought contact with Gilliams through Pink Poets? J.C.: Through Pink Poets? Certainly not. That group did not sit well with me. I knew Hugues Pernath, the so-called seventh Pink Poet, who died in 1975, well. After my film on Park Heverlee Abbey in 1964, he approached me to express his appreciation, but can you imagine me sitting around a table with someone like Patrick Conrad? No, I met Maurice Gilliams at private musical evenings hosted by friends of mine, Jean and Marleen De Crée-Roex. K.B./D.P. : At those musical evenings, did you have personal contact with Gilliams? J.C.: Yes, but the whole project was first discussed with him through friends and acquaintances, including Jean De Crée. At a certain point, they let me know that Gilliams would agree to it. He also appreciated the fact that the communications had been conducted in such a proper fashion, which explains the letter from Georges, when in fact, everything was already arranged. K.B./D.P. : We found a document in the Flemish Radio and Television (VRT) archives about the beginning of the film project, and it raises some questions. It mentions problems between you and Nic Bal, the programme director of the VRT. What was going on? J.C.: As far as I know, Nic Bal never had anything against me. I do remember that I wanted shoot the film on 35mm, and that I moved heaven and earth to be able to do it. By way of Jean De Crée, I had an ally in Adriaan Verhulst, chairman of the Board of Directors of Flemish Radio and Television (VRT). Jozef Deleu also lobbied for the project, but it was no use. Despite all the pressure, I had to do Het gedroomde boek (The envisioned book) on 16mm film. K.B./D.P. : Did you involve Jozef Deleu? J.C.: No, it was to Deleu’s own advantage. For some Flemish poets, a good word from Gilliams was very important, but Gilliams didn't have the time of day for anybody. K.B./D.P. : Did you approach Verhulst? J.C.: No. Much earlier in my carreer I had understood that it was better not to have direct contact with the organization's management. Officially, as producer, Ludo Bekkers was responsible for communicating with the VRT management. By way of intermediaries, I nonetheless tried to influence the decision-making at the highest level, especially with an eye to a 35mm production. J.C.: “Not too elitist!” That says it all! Bal did not boycott the project, but he wasn’t very enthusiastic about it either. The decision was made by the Board of Directors. K.B./D.P. : The production was approved by Paul Vandenbussche, director general of the VRT on 7 April, 1978. That was only two months before the proposed start of the filming. J.C.: That is the way it always was at the VRT. If we had waited for Vandenbussche’s approval before making preparations, we would never have met the schedule for starting the filming. No, the preparations had begun much earlier, at the end of 1977, as soon as we had recorded Maurice Gilliams’ passages. K.B./D.P. : Had you already recorded the passages that Gilliams reads in the film? J.C.: Yes. His voice was of fundamental importance to me. I wanted him to read some of the text himself. I wanted other texts to be read by a boy, someone whose voice had not yet matured. Once the sound recordings were behind us, I moreover knew for certain that it would be possible to produce the film. I did not want to take any risks. I knew that there had already been a few attempts to work with Gilliams and that they had all come to nothing. Don't forget that in 1977, he was already 77! K.B./D.P. : Was the script already final at that point, or did you have him read a range of texts, including some that were not used in the film? J.C.: It was all definite. We knew exactly what we wanted him to do. Georges and I had discussed the selection of the texts in detail with Gilliams beforehand. K.B./D.P. : Did you also discuss the scenario? J.C.: I don't think so. We only talked about the excerpts. He did not have any questions, probably because I had approached him through Jean De Crée. We finished the sound recordings as soon as he had given his approval. K.B./D.P. : Did he go to the VRT to record them? J.C.: No. At his request, the recordings were done at his home, on the Lange Gasthuisstraat in Antwerp. We began working in the evenings and worked through to the early hours. That was the way he wanted it. We were there together with a sound technician. Maria-Elisabeth, his wife, had already gone to bed. We worked on the recordings on different evenings and nights, I believe three in all. Gilliams lived at night. His house was supposedly a fortress, open to no one, but that is just a foolish story. I was welcome whenever I wanted and he was really pleased if you hung around for a while. He practically hugged you when you came by. I visited him a lot. At the time, I lived around the corner, on the Huidevettersstraat. The room where he worked was off limits. I never went in there. No one was allowed in there. K.B./D.P. : What did you and Gilliams talk about? J.C.: There were endless stories about his life. He talked at length about Gregoria of een huwelijk op Elseneur (Gregoria or a marriage at Elseneur), the book about his first, failed marriage, which he was revising for the umpteenth time, and which was ultimately published posthumously. He also never stopped talking about his family. The characters in his prose – aunt Henriette, aunt Theodora, Hermine, Aloysius – are all references to real people. Gilliams’ prose, from Elias of het gevecht met de nachtegalen (Elias or the fight with the nightingales, 1936), to Winter te Antwerpen (Winter in Antwerp, 1953), to Gregoria (1991) can all be taken literally. It is all about him and his family. Gilliams knew all walks of life, through his own personal circumstances. His father was a printer, who came from nowhere, while his mother was from a well-heeled family, who until the 19th century, held the rights to the paved road between Antwerp and Mechelen. K.B./D.P. : Did he speak in Antwerp dialect? J.C.: Only when speaking confidentially. It was wonderful – the ambiguity, which I cannot always achieve. He spoke, for example, of the ‘blowouts’ and ‘sexual traffic’ at the end of the 19th century. He had researched it all. As for his own adventures, his lips were sealed. He referred to himself as someone who had never stepped into modernity. D.P. : …and the novel, Gregoria of een huwelijk op Elseneur (Gregoria or a marriage at Elseneur) (1991), ends with a report that the candle factory of Papa Balthazar, Gregoria’s father, has burnt down. Not only has the marriage to Gregoria died, but it is the end of an era. J.C.: Yes, Gilliams partly rejected modernity. He had thoroughly read Mallarmé, but his language was deeply rooted in la Flandre profonde. He had also made a collection of Flemish lyricism. In addition to the experimental Paul van Ostaijen, he had respect for the pastor poet, Guido Gezelle. K.B./D.P. : Georges Adé characterized Er is niets dan hevig wit in mij (There is nothing but violent white in me), the original working title for the Gilliams film, as a cinematic composition. Would you describe the film as fiction? J.C.: No. At most, it is fiction in the sense that several poems, diary excerpts, essays and prose texts by a certain author have been put in a given order. That was the intention: the selection of a number of excerpts from the work which were read aloud and/or imagined or acted out. We arranged and condensed fragments from Vita Brevis, Gilliams’ collected work. K.B./D.P. : How did you determine the order of the fragments? J.C.: It was soon clear that we would build the film around the character of Elias, the protagonist of Gilliams’ ‘memory prose’ and Maurice Gilliams’ alter ego: an impossibly spoiled, utterly miserable child, born in the wrong place at the wrong time. Georges then made an initial sketch, literally a drawing with three circles. The first circle referred to the mother, who was associated with the city and the interior. The second circle was made up of aunt Henriette, cousin Aloysius and the country estate, and the third circle is about the sweetheart, whom the protagonist meets in the hospital. K.B./D.P. : In the film, the three clusters are handled successively, with the relationship between Elias and his mother first, then that between Elias, Henriette and Aloysius, and finally, the bond between Elias and his sweetheart. J.C.: That was the framework on which we could hang our other subjects, such as, ‘being an artist, ‘the object’, ‘interior and exterior’, ‘looking and being looked at’, and so forth. After Georges had provided the first plan, we selected the excerpts together. K.B./D.P. : In the film, the first cluster is exceptionally short. There are only four scenes, and it ends with the mother's death. The second cluster is the most extensive. That part has 20 scenes, with everything revolving around Henriette and Aloysius. J.C.: Those two are reflected figures. Aunt Henriette represents imagination, art, and Aloysius symbolizes adventure. K.B./D.P. : At one point, the boys, Aloysius and Elias, run away from the estate. Aloysius carries Elias on his back across a stream. They later dance around a campfire with girls. J.C.: Aloysius carrying Elias across the stream is Saint Christopher. It is an important image. Elias looks up to Aloysius. Aloysius later leaves. He becomes a sailor. K.B./D.P. : You chose recognizable scenes, such as Saint Christopher, or for example, Aunt Henriette performing a trick with a dove. She gets the dove to sit quietly on her head. J.C.: Yes, the film contains a lot of archetypal, even cliché-like scenes. I am perfectly happy with that qualification. K.B./D.P. : The third cluster, finally, has nine scenes and begins with Elias meeting the person he falls in love with at the hospital. 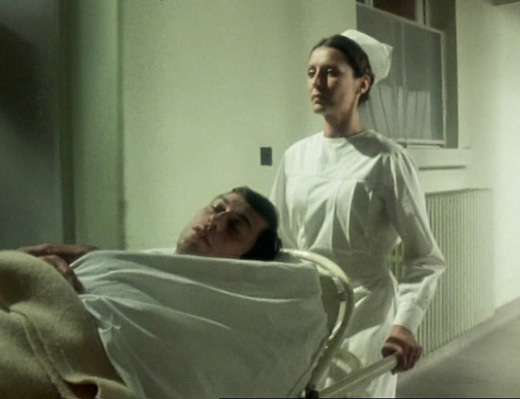 J.C.: That scene goes back to the real meeting between Maurice Gilliams and Maria-Elisabeth de Raeymaekers, who was a nurse at the Stuyvenbergh Hospital in Antwerp, where he had been admitted countless times. Maria-Elisabeth, referred to as ‘the sweetheart’ in the film, saves Elias. K.B./D.P. : In the film, the three sections are not identified as such. J.C.: That is true. The film is a continuous flow of short scenes, inspired by passages from Vita Brevis. In that sense, the editing is not important in this film. The sequences had to be strong enough in themselves to stand on their own, but we also tried to create associations between the fragments. Georges and I agreed that we should not integrally film either Elias of het gevecht met de nachtegalen (Elias or the fight with the nightingales) or any of Gilliams’ other prose. Even if we had wanted to, it would not have been feasible in the financial framework. K.B./D.P. : In 1978, there was not even enough money available for a 35mm production. J.C.: That was a big frustration, without a doubt. K.B./D.P. : The filming began two months after the general director gave the go-ahead for Er is niets dan hevig wit in mij (There is nothing but violent white in me). J.C.: Yes, in June, 1978. Everything had been prepared, right down to the details: the actors’ schedules, the technical staff, the facilities. Nonetheless, we had a terrible experience where technology was concerned. J.C.: When we looked at the first rushes, they flickered. When I saw that, it was undoubtedly the most dramatic moment, certainly in technical terms, of my whole career. K.B./D.P. : What was the problem? J.C.: The director of photography, Michel Houssiau, and the cameraman, Guido Van Rooy, had not discussed one specific technical issue. They had apparently presumed that there would be no interference between the camera and the lighting installation. It turned out that there was, with the indoor filming, where we had used artificial lighting. The outdoor footage was all right. K.B./D.P. : How did you resolve that? J.C.: We sat and talked about it for a long time with Michel Houssiau, Guido Van Rooy, some lighting specialists, and Ludo Bekkers, the producer. We finally decided that we had to stop the production. Bekkers asked Nic Bal and got his permission. K.B./D.P. : How did the discussion go? J.C.: I was furious. Guido Van Rooy felt I was too harsh. I had worked well with him for several years. Het gedroomde boek (The envisioned book) was our last project together. Later, I did work again with Michel Houssiau, on my documentary on the Liège architect, Charles Vandenhove. K.B./D.P. : What made you decide to ask Michel Houssiau to direct the photography? 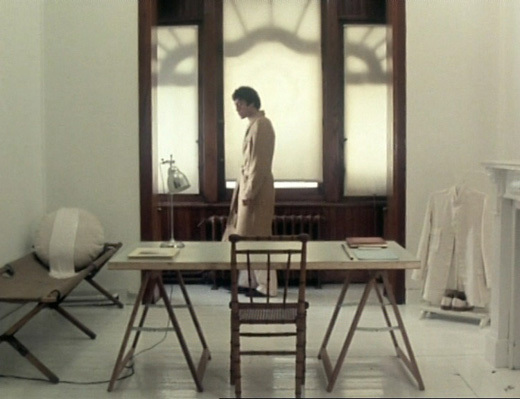 J.C.: He had worked with Chantal Akerman, for whom he had produced brilliant work. When I approached him, he had never worked for the VRT before. K.B./D.P. : Why wasn't it possible just to postpone the production for a few days? J.C.: Liane Lefaivre, the actress who played the mother, was leaving the country. We had no other option than to stop production in hopes of starting again later. All the people who had arranged their calendars to fit this production had to be sent home empty-handed. It was a real catastrophe. Thank goodness I have only experienced anything like that once in my life. K.B./D.P. : Stopping production was a financial setback. J.C.: Obviously. We were able to recuperate some of the expenses we had incurred, but others, over a million Belgian francs [25.000 euro], were irrevocably lost. We added up what could be recuperated and in the end, in August of 1978, we were given permission to start again. All of the contracts – with the supply companies, actors, technical staff – all had to be drawn up again from scratch. K.B./D.P. : Had any alterations been made before the second filming period started? J.C.: No, everything had been decided by December, 1977, when we did the sound recordings with Gilliams. K.B./D.P. : Did the new production progress smoothly? J.C.: Yes, we finished filming in November of 1978. 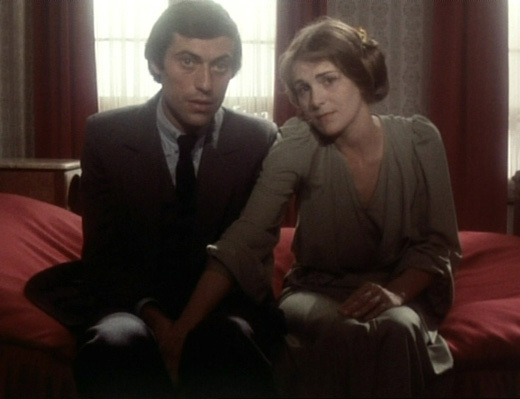 The film was edited in December and postproduction was in February, 1979. I became seriously ill during the postproduction. I was bedridden for months. K.B./D.P. : In all of the concept texts, the film is referred to by a different title: Er is niets dan hevig wit in mij (There is nothing but violent white in me), a line from Gilliams’ 1927 poem, Tristitia ante. Why did you change that title? J.C.: Leo Pleysier, another Belgian writer, had published his book, Niets dan schreeuw (Nothing but a scream) in 1972, – and it was also published by Orion, who published Gilliams’ Vita Brevis. I felt that the two titles were too similar. I did use the verse from Tristitia ante, read by Gilliams, in the film, but I felt that Het gedroomde boek (The envisioned book) was a better title. It is from a passage in Gilliams’ De kunst van de fuga (The art of the fugue, 1953), his second book of diary excerpts and essays: “The envisioned book, with no events, no intrigue, no description, no noticeable beginning or end,” and he goes on to quote Flaubert, “A book about nothing, that would work simply by means of its intrinsic stylistic power”. We had something similar in mind for the film: a series of autonomous scenes, almost without beginning or end, which nonetheless had to constitute a coherent whole. K.B./D.P. : The title can also be interpreted as if the film were a version of Gilliams’ collected work as you and Georges Adé dreamed it. J.C.: That is another valid interpretation. J.C.: …that scene was filmed in a back room. The table is up against a window and there is a view to the outside. In the rest of the film, there are practically no views. K.B./D.P. : In the same scene, Elias suddenly appears as an adult. He is also shown lying under the table. This sequence is based on the first lines of Oefentocht in het luchtledige (A trial journey in the vacuum, 1933), where Gilliams only describes Elias's world as a child. Why did you decide to present Elias as a child and as an adult at the same time, in the same sequence? J.C.: Elias does not become an adult. He remains an awkward individual with no idea of how to deal with his body. He will never find his own identity. K.B./D.P. : In some scenes, by exchanging Elias the child, or the youth, for Elias as an adult, you suggest continuity in the character. That calls for a psychological interpretation. It is in every way a conventional biographical progression of child, youth and adult. J.C.: I can better identify with the description of ‘continuity’. There is in fact no real change. I see the characters in Het gedroomde boek (The envisioned book) as puppets – certainly not people of flesh and blood. There is no basis to the characters’ actions. There is no psychology at all. What does Elias actually feel? I have never experienced psychology in Gilliams’ work, …perhaps in Gregoria of een huwelijk op Elseneur (Gregoria or a marriage at Elseneur), but that is the reason I have so much trouble with that book. K.B./D.P. 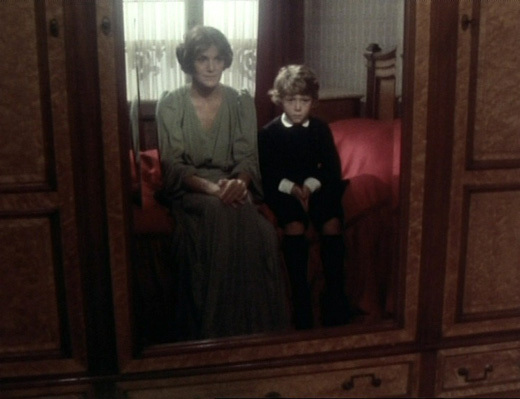 : In another scene, you first see the adult Elias sitting beside to his mother on a bed. Both are looking at a mirror. Then it is the child who is sitting next to his mother on the same bed. That suggests that the adult Elias has not been able to separate himself from his mother. J.C.: Again, I was not interested in psychology. I thought the scene on the bed was strong, the way an image is different in the mirror than it is physically. You see the reflection first, then the two bodies. I feel that Elias actually seems most mature as a child. The child Elias is – as Visconti would say – the ideal instrument of seduction. K.B./D.P. : The soundtrack is made up of passages from Gilliams’ narrative and reflective prose, pages from diaries and poetry, partly read by Maurice Gilliams himself and partly by a youngster, Marcel Neefs. Was that choice also made to suggest continuity? J.C.: You could interpret it that way. K.B./D.P. : Gilliams reads with a great deal of pathos, but his readings still make a big impression. Once you have heard that voice, you read Vita Brevis differently. J.C.: Text is emphatically present in Het gedroomde boek (The envisioned book). The kind of Dutch that Gilliams used is virtually an extinct language. K.B./D.P. : The film presents Elias, the mother, Aloysius, aunt Henriette and the sweetheart. What is remarkable is that a number of key figures in Gilliams’ prose are completely absent: the grandmother, aunt Theodora, cousin Hermine, etc. Another noteworthy absence is the father, to whom Gilliams devoted extensive passages. In Winter te Antwerpen (Winter in Antwerp), he described his mother’s deathbed. He and his father are witnesses to her struggle with death. 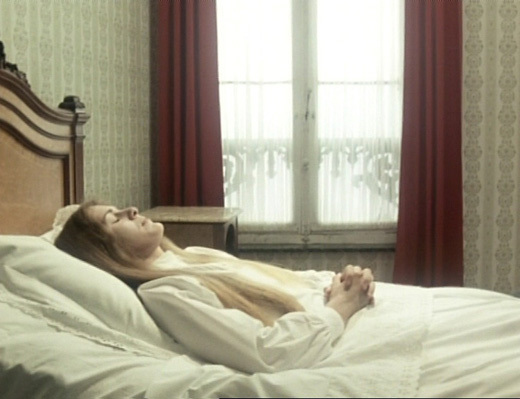 While this scene is in fact part of the first segment of the film, the father is not present at all. Why is that? J.C.: Het gedroomde boek (The envisioned book) has a very specific focus, namely the relationship between Elias, the protagonist, and women – mother, aunt, sweetheart. We wanted to concentrate on the female figures in Vita Brevis. K.B./D.P. : If you are not careful, you could even think that all three are the same woman. J.C.: Indeed. They are three mirrors. There are three women in the film, and Elias appears as a child, a youth and an adult. That was important for us: three women and three ages. But there are still nuances. The mother is distinguished, Henriette is hysterical and the sweetheart is rigid and abstract. K.B./D.P. : If the female figure is so important, then it is at least strange that Gregoria is not presented, either in the second or the third part of Het gedroomde boek (The envisioned book). Gabriëlle Baelemans, alias Gregoria in the novel of the same name, was Gilliams’ first wife. Long before Gilliams met his second wife, Maria-Elisabeth, at the Stuyvenberg Hospital in Antwerp, he was briefly, and unhappily, married to Gabriëlle, or Gregoria. J.C.: That novel had not yet been published when Georges and I were working on the script. J.C.: I found the prose illegible. Never for a moment did we consider including that text in the script. I am unable to appreciate Gregoria of een huwelijk op Elseneur (Gregoria or a marriage at Elseneur), which was published posthumously in 1991, in any way whatsoever. I always considered Gilliams a poet. K.B./D.P. : Gregoria could have presented a very different, less flattering picture of Elias’, or Maurice Gilliams’, ideas about love. In contrast, Het gedroomde boek (The envisioned book) ends with an unadulterated, idyllic image of eternal love. “We die slowly in order to shine together longer.” The finale is a happy ending. J.C.: The film definitely ends with a celebration of love. That was the choice we made. Once or twice in our lives, everyone produces a happy ending! K.B./D.P. : Another decision concerned the selections from the collected work. All kinds of texts – poetry, reflective and narrative prose, diary fragments – are indeed represented, but your selections were mostly from Elias of het gevecht met de nachtegalen (Elias or the fight with the nightingales) and Winter te Antwerpen (Winter in Antwerp). The other Gilliams, the gothic Gilliams, dark and unheimlich, is not shown in Het gedroomde boek (The envisioned book). J.C.: What texts are you thinking of? K.B./D.P. : Some of the stories in Oefentocht in het luchtledige (A trial journey in the vacuum, 1933), and his earlier cultural-political novella, Libera nos, domine (Free us, Lord, 1959), some of his ‘expressionist’ poems and Inleiding tot de idee Henri De Braekeleer (Introduction to the idea of Henri de Braekeleer, 1941), in which Gilliams goes into detail about the female in De Braekeleer’s paintings and drawings. Gilliams wrote about De Braekeleer immediately after his failed marriage to Gabriëlle Baelemans. J.C.: Those works do not appeal to me. Maybe that is the explanation. Everything in that genre that came after Edgar Allan Poe is of no interest to me. We also had to make choices. The length of the film was already set at only 45 minutes. We had to make rigid selections. K.B./D.P. : The second part of the film includes scenes in which Elias, the protagonist, is alone in his so-called ‘chastening cell’. Gilliams wrote these scenes in the first edition of Elias of het gevecht met de nachtegalen (Elias or the fight with the nightingales), more precisely in the second part of the book, which he later deleted. J.C.: I never read the first edition of Elias of het gevecht met de nachtegalen (Elias or the fight with the nightingales), so I don’t know the second part of Elias. K.B./D.P. : Then that material from the first edition must have indirectly slipped into the film – by way of the passages that Gilliams filtered from the first edition of Elias of het gevecht met de nachtegalen (Elias or the fight with the nightingales) for De man voor het venster (The man at the window, 1943), his first book of notes, fragmentary essays and diary excerpts. J.C.: That would have to be the case. Georges and I never discussed the first edition of Elias. We based our work exclusively on the second edition of the collected works, published by Orion. J.C.: I put a lot of effort into the decors, not just the ‘chastening cell’. Most of the interiors are virtually empty. Only the essential elements are there, almost like set pieces. You cannot orientate yourself in those spaces. These unrealistic elements were important to me, while on the other hand, I did not want to work in the studio. I remember that Georges was on the set when we were filming the scene in that room – one of the few times, by the way, that Georges was there. I was primarily focused on the window. Georges pointed out the layout of the objects on the table. With references to Mondrian’s studio, he made a few changes. He felt that the table had to have a meaning, and I went along with him. K.B./D.P. : Georges is also in the film. J.C.: Yes, at the point when Elias is wandering around the city, you can see Georges in one of the living rooms. K.B./D.P. : Even the outdoor shots are rather abstract. You cannot discern what city Elias is walking around in. J.C.: We intentionally distanced ourselves from Antwerp as a location. I spontaneously associate Gilliams with Antwerp, the city where he lived his entire life and about which he wrote at length, and not always necessarily in loving terms. But for the film, we turned it into an abstraction. Elias is walking around in a fictional city. We avoided recognizable locations in Antwerp. Most of the filming was even done outside Antwerp. Het gedroomde boek (The envisioned book) is a kind of doll's house. You could say that the film is just made up of decors. Even most of the outdoor scenes appear to be in a cardboard environment. K.B./D.P. : The subtitle of the film is Variations on Vita Brevis by Maurice Gilliams. Because Het gedroomde boek (The envisioned book) is a cinematic adaptation of Vita Brevis, the subtitle is certainly not inappropriate. 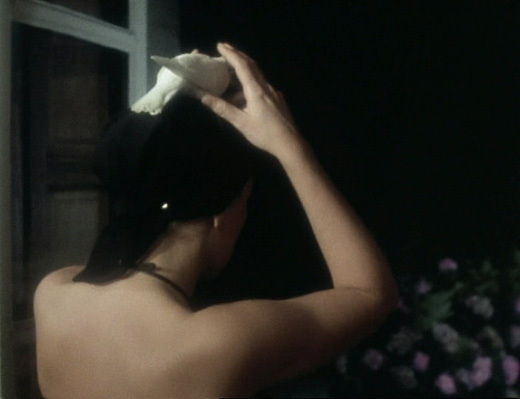 The ‘variation’ is, in the first place, in the selection of the fragments, in what is and is not included in the film. We still need to speak about imagination in film. 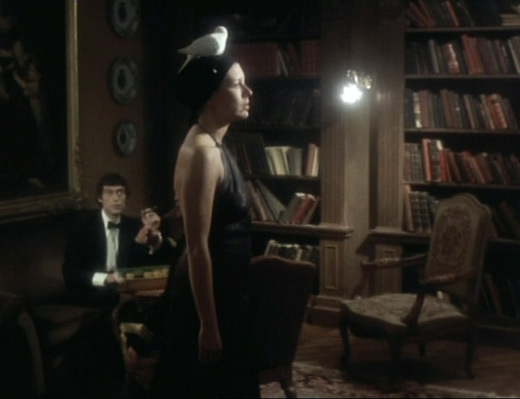 Most of the scenes in the first and the second part of the film are faithful to the text. In Elias of het gevecht met de nachtegalen (Elias or the fight with the nightingales), there is one scene during a thunderstorm, in which Elias is driven into the arms of his aunt Henriette. In your filming of that scene, your camera, as it were, follows the pen of the author. J.C.: Some passages are filmed literally, while others are interpreted somewhat more freely. K.B./D.P. : In some cases, the filmic imagination is richer than the literary imagination. In Winter te Antwerpen (Winter in Antwerp), Gilliams describes “four powerfully built men” moving the furniture from the estate. The film is faithful to this scene in the text. It is also a strong image, perhaps even stronger in the film than in the book. J.C.: The interior – several pieces of furniture – was carried outdoors. ‘Inside’ is now ‘outside’. The visual image was in fact built up as we worked, in such a way that ‘the inside’ obstructed the view to ‘outside’. Yes, the visual image in the film is more expressive than in the text. Het gedroomde boek (The envisioned book) does entirely refer back to the collected work of Gilliams, but the film also had to function on its own. The film had to have its own strength. Film is not literature. K.B./D.P. 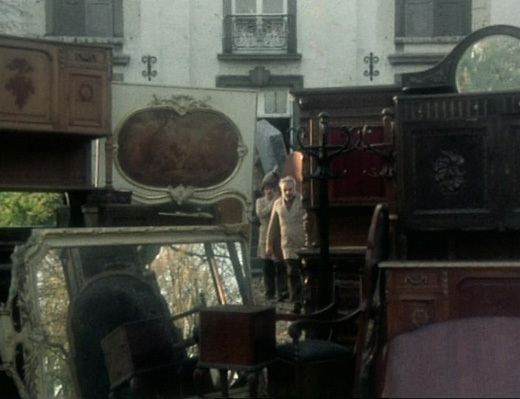 : The image of all that furniture stacked up, some of it with mirrors, almost looks like a Magritte painting. It is primarily a strong image, rather than a ‘representation’ of literature. J.C.: I was not concerned with Magritte at the time. It was a way of ‘boarding up’ the image, as it were. Everything was removed, put outdoors, but everything remained and it turned into a wall. Exterior became interior. K.B./D.P. : Other fragments from Vita Brevis do not allow for such ‘representation’ or ‘imagining’. In Winter te Antwerpen (Winter in Antwerp), Elias is wandering through Antwerp, while constantly developing his thoughts. In the film, you see a protagonist wandering through a city, but you do not ‘see’ his thoughts. The narrative has been split, radically, from the philosophical element. The image of the meandering Elias is in fact very weak in the film. J.C.: My visual imagery is usually that way. In Het gedroomde boek (The envisioned book), they are sometimes too strong, too laden. The image of a wandering, introspective Elias was essential. K.B./D.P. : The wandering Elias keeps recurring in the film. 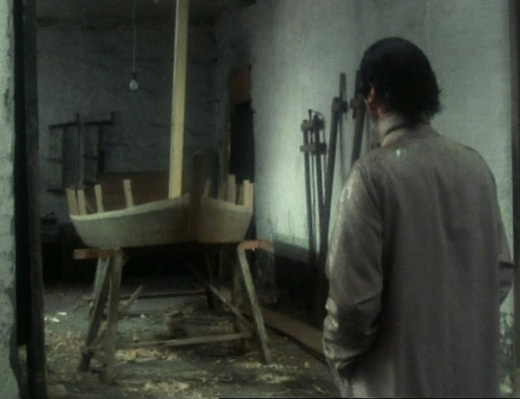 He also observes a small boat being built in a workshop. The film devotes five short passages to that – five steps in the building process. J.C.: The boat was an important image for Gilliams. It was the equivalent of adventure. 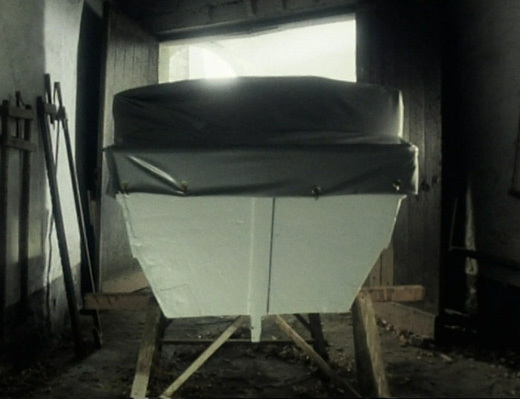 In the film, the boat is also an object. In the fifth scene, the little sloop is wrapped in a taut, shiny sailcloth. It has become a hard, closed object, a picture of the work of art, the way Gilliams imagined it. K.B./D.P. : You could also read the image as castrated desire. J.C.: Or as a coffin. K.B./D.P. : As we mentioned, in the first two parts of Het gedroomde boek (The envisioned book), the text is followed rather faithfully. In the third part, about Elias and his sweetheart, the interpretation is freer. In Winter te Antwerpen (Winter in Antwerp), Gilliams wrote about meeting his future wife, Maria-Elisabeth de Raeymaekers, but beyond that, he was always very discreet about the nature of his relationship with her. Gilliams never wrote about Maria-Elisabeth as his ‘sweetheart’. That description was invented by you and Georges Adé. J.C.: He wrote about the ‘sweetheart’ in his long poem, Country Solo (1927). K.B./D.P. : You used Gilliams’ poetry in order to work with Elias and his sweetheart. The final passages in the film are not based on his prose, because in Vita Brevis, Gilliams never describes a love relationship. Country Solo (1927) had in fact been written long before Gilliams’ second marriage with Maria-Elisabeth, even well before his first, failed marriage with Gabriëlle Baelemans (27 August, 1935, to 12 February, 1936). J.C.: We also used later poems as inspiration, including Winterkust (Winter Coast, 1954), in which Maria appears by her name. K.B./D.P. : Still, it is worth noting that you distilled narrative or story lines from the poems. At the end of the film, for example, the sweetheart says to Elias, “stay and live here”, a literal quotation from the poem, Dreamt Happiness (1927). K.B./D.P. : There are also images in the third part that only partly refer to Gilliams’ work. Gilliams wrote, “Compelled by your love game, / I sink down as into a bath of lukewarm milk, / and feel the pounding of your heart”. 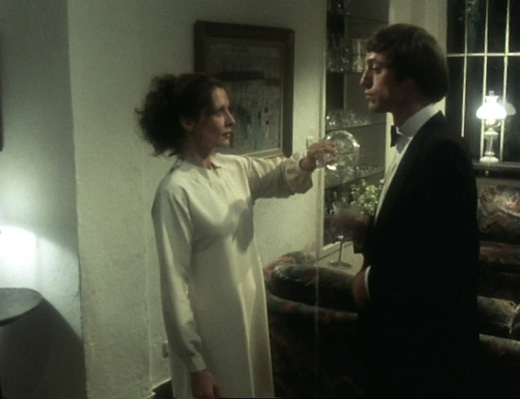 In the film, the sweetheart slides, fully dressed, into a bathtub filled to the brim with water. K.B./D.P. : Another image was completely invented by you and Georges Adé. The sweetheart comes in with a carafe of water and a glass. Elias accepts the glass and drinks it all. The sweetheart starts to refill it, but Elias pulls away, and the water pours onto the floor. J.C.: Yes, poetry allows a lot more. K.B./D.P. : The images that you yourselves created, that in other words were not based on Gilliams’ literary imagination, are open to interpretation. It is more than ‘representation’; it is imagination. Why did that only happen in the third part? J.C.: All I can say is that we referred to specific poems and arrived at ‘images’. K.B./D.P. : There are meaningful gestures: a clothed woman sliding into a bath, water being poured outside the glass… Love is being ‘celebrated’ with very symbolic visual language. J.C.: It is perhaps even pathos. I can imagine that criticism. K.B./D.P. : Where your selection of actors is concerned, we found a document at the VRT archives, probably written by the producer, Ludo Bekkers, which states, “The characters need to have as great as possible a physical resemblance to the characters in the literature.” Gilliams devoted countless descriptions to the mother and aunt Henriette, so it is plausible that actors could be found who physically resembled them. In contrast, Gilliams hardly ‘pictured’ Elias or the sweetheart at all. Elias is always a first-person protagonist in Gilliams’ prose, who observes, describes and clarifies the world around him. Only in the second part of Elias of het gevecht met de nachtegalen (Elias or the fight with the nightingales), a passage later deleted by Gilliams, do we get an image of the protagonist, portrayed by his boyhood friend, Olivier Bloem. And how would the sweetheart look like? As we already mentioned, Gilliams wrote only poetry - never prose - about the sweetheart. J.C.: Georges and I interpreted the characters. The clothing was inspired by Gilliams' text as closely as possible. For the hairdos, we used paintings by Henri De Braekeleer and Gustave Van de Woestijne. In general, the film is strongly based on the work of De Braekeleer. Het gedroomde boek (The envisioned book) is not only based on Gilliams’ literary imagination. J.C.: I was looking for that emptiness, the unrecognizable. There could be no association between Gilliams’ poetry and theatricality. I moreover would have no idea what actors might have been appropriate. K.B./D.P. : To play Elias, you actually chose someone who was on television almost every day, the news anchorman, Dirk Lesaffer. J.C.: That is true, but he had not been presenting the news for very long. For me, he was the embodiment of the Elias figure: sensitive, dreamy, introverted, asexual… I don't remember how many other people I had considered. K.B./D.P. : In a conversation with Herman De Coninck, a journalist for HUMO magazine, producer Ludo Bekkers supposedly said that Lesaffer ended up “in the film at a point when he was having his own problems (with himself)”, and that this was good for the film. J.C.: I chose Lesaffer, no one else, and as far as I know, Lesaffer had no problems. He was quiet and friendly and he did what I asked. K.B./D.P. : Elsewhere, Ludo Bekkers wrote, “His (Lesaffer’s) physical appearance answers the adult Elias in Gilliams’ work so perfectly that for him, no other possible candidate even came close.” What was that based on? You had not read the first edition of Elias. J.C.: That is true. I recall that we had to come up with really good arguments in order to get permission to hire Dirk Lesaffer, because he was working for the public news service. There were deliberations at the highest level before we were given permission. K.B./D.P. : The mother was played by Liane Lefaivre, an architectural theorist, aunt Henriette by Myriam Ceriez, a literary journalist, and the sweetheart was played by Antoinette Sturbelle, a graphic designer. Two of the three actresses, Liane Lefaivre and Antoinette Sturbelle, were not only unknown in Flanders, but they were even unfamiliar with the Dutch language. J.C.: There are women who can be mothers without having had children. That is an advantage. They do not have to imitate. That is why I chose her. J.C.: I didn't know anything about that. K.B./D.P. : What instructions did you give the actors? J.C.: Almost none. I wanted degré zéro acting. J.C.: The incidental spoken scenes were not successful, that’s true. I wanted cardboard characters, unreal beings. I wanted as little expressiveness as possible. K.B./D.P. : Wouldn't you need to call on professional actors if you wanted a high degree of abstraction or unreality? J.C.: Maybe we didn't approach the casting as we should have… Our intention was to create a cinematic poem. Het gedroomde boek (The envisioned book) is a succession of stills. Most of them are a series of images with nothing in front of them and nothing after them. K.B./D.P. : That is only partly true, as you present Elias as a child, as a youth and as a young adult. The building of the boat is also a succession of scenes. No fewer than five takes are spent on it, edited in between other scenes. The relationship between Elias and the sweetheart has its highs and lows as well, so there really is some development. J.C.: There are a few developments in the film, but it is not a filmed story. We had no intention of achieving any kind of completion, but wanted to express the atmosphere in Gilliams’ work. We visualized several strong passages from Vita Brevis, in the assumption that an inner dynamic would evolve amongst those fragments. 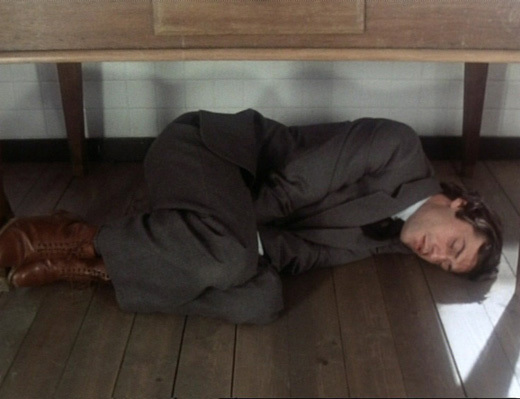 That, by the way, is how I read Gilliams’ work. He never wrote a novel. They are just sketches. I always compare his work with that of Claude Debussy. K.B./D.P. : You used Bach, not Debussy, for the soundtrack. André Laporte was responsible for what is generally oddly described as the ‘musical decor’ of the film. J.C.: Laporte is a fan of Gilliams’ work. They had also met one another. K.B./D.P. : The musical decor is composed entirely of fragments from Bach, not always in their original versions. You used the Busoni variations for piano of two of Bach’s organ chorales, and the chaconne from Bach's second partita for violin is used in both the original version and in Busoni’s arrangement for piano. The sarabande from the fifth cello suite is also heard, in Bach's own arrangement for lute. Was the reference to making music at home important? J.C.: Yes, that did play a role. As I said, it is the interior, the inner space, that is especially important in Het gedroomde boek (The envisioned book). K.B./D.P. : Somewhere in the film, Gilliams reads a passage about Bach from his book De kunst van de fuga (The art of the fugue, 1953), actually the first three sentences of the book. It seems as if that fragment was chosen to justify the soundtrack. J.C.: No, that was not the case. Gilliams’ voice had been recorded long before. I only approached André Laporte after all the filming had been finished. K.B./D.P. : Het gedroomde boek (The envisioned book) was only broadcast on 9 January, 1980. According to the radio & television magazine, HUMO, the broadcast had originally been planned for 17 October, 1979, then 19 December 1979, and finally for 9 January, 1980. J.C.: Programming the film was another disaster. In October 1979, there was a strike. In December 1979, Het gedroomde boek (The envisioned book) had to be cancelled for a live broadcast of a football game. Fortunately, Maurice Gilliams and his wife had already seen the film. A preview had been organized for them with the top echelons of the public broadcasting service, including Joz. Van Liempt, department head for the arts, Jan Van der Straeten, director for culture, Nic Bal, programming director and Paul Vandenbussche, general director. Jozef Deleu was there as well. Gilliams was received like a king. The VRT management was clearly delighted. Moreover, for them, Het gedroomde boek (The envisioned book) was projected as a film, not as a video. There was also a version produced for cinema. K.B./D.P. : What was Maurice Gilliams’ reaction to the film? K.B./D.P. : Most of the reviews in the press were also full of praise. J.C.: Even HUMO was moderately favourable. Happily, the film caused me no harm. It could have been otherwise. A film about Vita Brevis is something you could really break your neck on. K.B./D.P. : Did you stay in touch with Gilliams? J.C.: Yes, until he died in 1982. Initially, it was for professional reasons. When the Dutch version was finished, I immediately started on the French and English versions. I believe I visited Gilliams twice at his home with Wanda Boeke, who translated the English version. She wanted to go through a number of passages with him. J.C.: It worked, too. The film was shown at a festival in Venice. If I recall correctly, it was later also broadcast by several PPS stations in America, on the initiative of an organization involved with difficult productions for television! I also find the English and the French versions better than the Dutch version. J.C.: The translations by Wanda Boeke, in English, and Georges Adé, in French, are superb. For the French version, we initially approached Roland Barthes to read the text excerpts, but he wouldn't go for it. “I have to take the utmost care not to get distracted and to decline any undertaking that is not work related.” Three months later, he died. We worked with ‘unknown’ voices. K.B./D.P. : Why did you want to work with Roland Barthes? J.C.: That should be obvious. I see Het gedroomde boek (The envisioned book) as a kind of Fragments d’un discours amoureux. K.B./D.P. : The voice of the youth is more successful in the French and English versions. J.C.: I was not overjoyed with the voice of the boy in the Dutch version. I had asked an acquaintance, Ludo Frateur, to look for a replacement, but he did not find anyone else. J.C.: All I can do is repeat that I regard especially the English version as better than the Dutch, and not only because of the boy’s reading. J.C.: There is a big difference between the Dutch text and the English translation. Wanda Boeke really hacked away at Dutch text. She read Gilliams’ text in an exceptionally critical way. A great deal of time was devoted to the translation. K.B./D.P. : Did Gilliams see or read that translation? J.C.: No, although I believe that Boeke did try to get feedback from him. That text was also better read. It was more neutral. K.B./D.P. : So you were ultimately not really happy with the way in which Gilliams read his own texts? J.C.: No, I wasn’t. It was too affected. At a certain point, I wanted to get away from all the pathos. I soon realized that for the Dutch version, I was stuck with Gilliams’ voice. What other alternative could I have possibly come up with? Le livre rêvé and – even more so – The Envisioned Book actually gave me the opportunity to deal with the text differently, in a far lighter manner. All that heavy Flemish had to go.